We went for a walk today. It had been a while since the last one. I had backed up a step and worked on other things in the round pen since we weren’t making progress with the walks. Apparently that was what he needed. On a loose lead we walked down the drive working on voice commands for walk trot and whoa. He stared in fascination at the cows grazing the corn stalks. He had gotten used to them I thought in his pen but it came as a shock to discover they were in other places too! He sniffed the ground, and pawed it one time. For why I don’t know. And we walked calmly and happy even back to the barn. Not all the way of course. I stopped by the trailer to practice loading. He sniffed a little and walked right in. Then we went to my newly, somewhat, cleared play area to play with the tire. He hopped over it happily then with work I got him to step on it. Then I discovered that after sitting idle for a few years it needs repacked. That was the end of that. I recently read an article about hand walking and how the lady kept her horse from getting bored at it by teaching tricks. I had thought to bring along my clicker but couldn’t find it as I rushed out the door. She talked in the article about using her voice instead of a clicker and it sounded like a pretty good idea. I noticed, while making the effort, that I stay very quiet when working. But, when I remembered to talk, it seemed to work. So we went back to the other horses. Almost. First I picked up feet, including the hind feet, for real, for the first time. 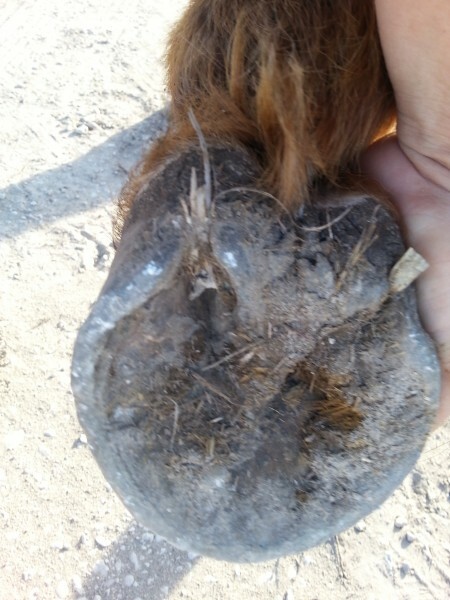 He has a light colored patch that on closer inspection is from scar tissue, a wire cut across the back of the pastern. And the strangest shaped hoof on that same side. 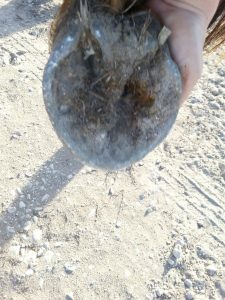 It doesn’t appear to be from the same injury, just ill formed with one side of the hoof much shorter than the other. I am holding the hoof square with the ground in both pictures not at the angle that it would appear. Yes he also needs a trim and yes he is base narrow, and walks with the weight on the outside edge of the hoof causing it to wear more and flare to the inside. Not a big deal, either problem, and the oddly shaped hoof probably isn’t either. It’s just weird. I often wonder were are your children . well thank goodness all who wander are not lost! Yes, shorter from the point of the toe to the heel bulb on one side than the other. In the picture on the left the top of the picture is in a straight line with the hoof. See the difference in the distance from the top of the picture to the heel bulbs? He and Onna wear them exactly the same. Just like Tally did. It doesn\’t seem to bother him any, he never shows the slightest sign of lameness. do you think it will hold up to hard work? Once he is carrying weight and riding all day? With all the lame horses showing up around our barn, it is beginning to seem that conformation is VERY important. I know that is not a fair question. You could not know till it happens.